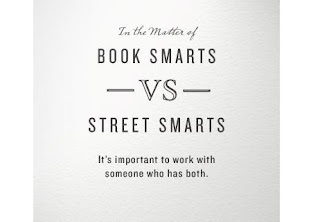 Discussions about "smarts," of both the book and the street varieties, usually feature two types of people: someone who graduated from college explaining that "book smarts" are superior; and someone who didn't graduate from college claiming that "street smarts" are more better. The two parties cite their various evidence (usually something like, "I know a guy who..."), but usually fail to convince the other to change positions. In the end, these debates are largely a waste of time because there's always more to the story: "book smarts" consists of more than abstract knowledge, and "street smarts" consists of more than actual experience. There's an interplay between them that actually makes it very difficult to determine where one stops and the other begins. So what does "book smarts" actually refer to? It refers to learning that happens through some type of formal process (usually associated with classrooms, instructors, and abstract knowledge). And what does "street smarts" actually refer to? It refers to learning that happens through some type of informal process (usually associated with situations, interactions, and concrete experiences). I propose, then, that "book smarts" and "street smarts" aren't actually opposed to one another. The dichotomy we've built between them (placing "versus" in the middle) is a false one that pays no attention to how learning actually happens. The two need each other because the combination of abstract knowledge and concrete experience combine to form the bedrock for all we're able to comprehend. Those who rely heavily on abstract knowledge (formal learning processes) are also relying on some amount of concrete experience (informal learning processes) to inform their views of how to wisely act or react in a given situation. This much should be obvious because all the knowledge delivered through formal processes came from experiences that were collected, analyzed, distilled, and packaged to be passed along to us. And it goes the other way too. Those who rely mostly on their own experiences are, even if they don't realize it, also relying on at least some amount of knowledge gained through formal learning processes. After all, no one could sign a check if their first-grade teacher didn't teach them how to write their own name! A well-balanced combination of the two is best. Sometimes knowledge adds depth to someone's experiences, and other times experience deepens someone's knowledge. Either way, both components are always present and always interacting with one another to inform the decisions we make and the actions we take at any given moment.